I’m going to let you in on a possibly embarrassing secret: I never really wore deodorant very often until I was in my late 20’s. I probably should have, but I hated the way it left that white streak on my clothes (and I wear a lot of black) and most of the scents were way too strong and headache-inducing for me. By the time I decided “Yeah, I probably should be wearing this stuff” I knew a lot about icky chemicals and the aluminum in most antiperspirants did not sound good at all. And so I started researching some more natural options. I’ll take a brief moment here to note that these are deodorants, not antiperspirants. Sweating is a natural, healthy process and I don’t believe it’s a bad thing. The bad thing is the odor that comes with it which is caused by bacteria metabolizing the sweat. Deodorants don’t stop you from sweating, but they do help with the smell usually by cutting down on the bacteria that might be causing the odor. So I set out on Etsy to find some natural options to try. One thing I love about indie brands is that I can get samples to try before I buy a full size, which is really important when it comes to something so personal that reacts different dependent on body chemistry and that has a (natural) fragrance. 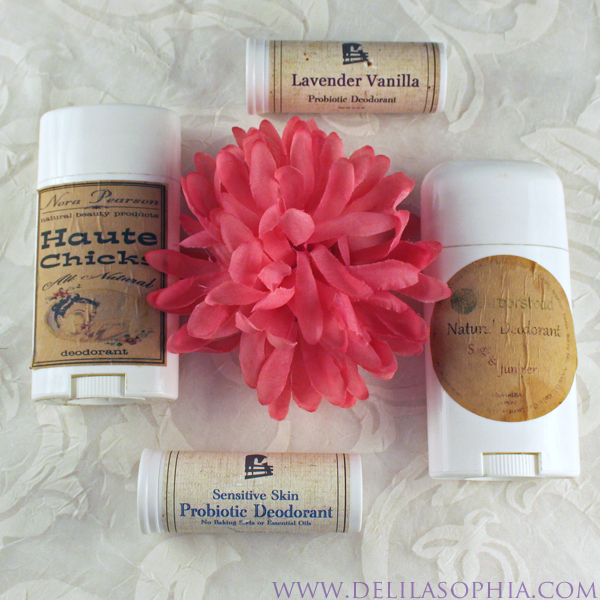 That being said, these 4 natural deodorants have been among my favorites that I’ve tried. This is my current go-to and I love the Sage & Juniper scent that I ended up settling on. The formulation of this one is creamy and it absorbs the best into my skin. The fragrance of the essential oils is subtle, but it also gives me that little bit of reassurance that it’s working and I like that. I do like to reapply if I’m doing a lot of physical work or if it’s really warm out and I know I’m going to be around people a lot. The other big plus for this one is that Arborstead carries several fragrances and that you can get samples to try a couple before you land on one. This one is also available without the baking soda if you find you’re sensitive to it. If you’d like to try an all natural deodorant that will give you a cue that it’s working and you like or don’t mind a creamier texture, I’d definitely suggest giving the Arborstead deodorant a try. Ingredients: Extra-Virgin Coconut Oil, Natural Beeswax, Raw Shea Butter, Arrowroot Powder, Baking Soda, Kaolin Clay, Avocado Oil, Essential Oils. Nora Pearson’s Haute Chicks deodorant in the Vanilla and Grapefruit fragrance is one I still use occasionally for lighter activity days or when I’m in that “grapefruit” scent mood which seems to be happening often lately. The fragrance on this one is a bit lighter and the formulation is more like a traditional unisex stick deodorant (not the powder or gel). I actually preferred this one for quite a while and only made the switch because I found I generally prefer the creamier texture. In addition to the scent I have, I counted over 10 more different scents for her Haute Chicks deodorant, plus several more in her masculine Man Funk version as well. If you’re on the fence about switching and want to try a formulation that is similar to your current stick, Nora Pearson’s deodeorant is definitely a good option to consider. I’ve tried two formulations of the Emily’s Homestead Probiotic deodorants: the regular and the unscented which is also free of baking soda. These deodorants use probiotic good bacteria to discourage “bad” bacteria (the ones that cause the smell). Both of these are in between the other two in texture creamier than the standard stick, but still very solid. I have the regular 0.75 oz tubes and I use these when I travel. I keep one in my purse just in case I forget (which still happens), and the other in my travel bag. The Lavender Vanilla Emily’s Homestead deodorant is what converted me to natural deodorants over the course of one summer car trip. I could smell the lavender (but no sweat) and it really helped ease the self consciousness. Emily’s Homestead offers a few different fragrances, too, so if lavender isn’t your scent you might find that one of the other options suits you better. Note: Emily’s Homestead now uses magnesium oil in some formulations which I haven’t tried (but now I want to!) and also offers a shea butter-free version which I also haven’t tried. Ingredients (Sensitive Skin): Cocoa Butter, Beeswax, Shea Butter, Avocado Oil, Coconut Oil, Arrowroot Powder, Shelf-stable probiotics (that include lactobacillus and bifidobacteria), and Vitamin E oil. So there you have it, 4 natural deodorant options for you to try. 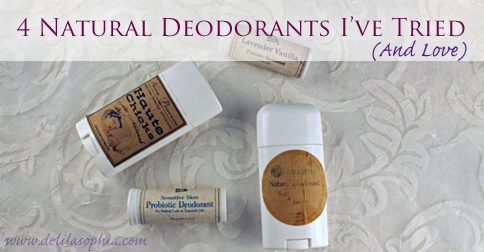 What are you favorite natural deodorants?